Textiles and embroidery offer me the opportunity through joining, cutting and embroidered battlements to make a variety of unplanned connections for for my art quilts. Going beyond this is the painting of the surface, which provides additional texture. It is through the common engagement with embroidery, paint, stitches and textile that links are formed between different techniques and a unitary statement in art is achieved. Drawing from tradition of embroidery, I use the contemporary embroidery stitch for its design component. Embroidery stitches are made longer, shorter, flatter and thicker by using threads of different thickness and varying of stitch sizes, making them uneven as well – even using different textiles to embroider e.g. string or wire – this enhances the design. I avoid symmetry, especially the stagnant and stifling kind that is commonly found in traditional designs and kits. For me these designs are but mere teaching tools and not an end in itself. They are too predictable and repetitive in ideas and have usually been done before and are always too easy to interpret. The use of these quilting designs rarely reveals the poetry of the individual who completed them. The accent for me is not “perfect craftsmanship” nor the piece's washing ability, but the quilt's physical and visual characteristics that are totally subjected to the speculation and art ability of the the artist (quilter). I do not create quilts for the washing machine NOR the ability to “match” certain colour schemes or co-ordinate with existing interior designs. The quilt must stand on its own as a work of art quilting, neither am I interested in the neatness of its execution. There is no right or wrong in art. I am not a believer in the perfect stitch, nor should all stitches be executed in the same direction or be embroidered with the same thickness of thread and needle. I feel that traditional quilting rules can be stretched, broken and even totally disregarded. Today's advanced standards of computer imaging and machine embroideries are but duplications of programmes created by computer manufactures and reveals nothing of the artistry of the individual. Different programmed sewing stitches must be used as a means of self-expression, and not as an end in themselves. 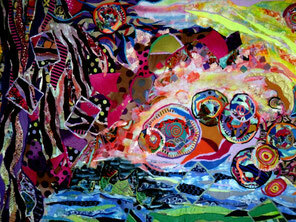 All original art – painting, music, sculpture and textile art (quilting) – is free as long as its structure informs. With this statement I mean – to express the quilter's ideas, emotions and design ability. It is indeed true that all arts have the same aim, namely, to inspire emotion and contemplation in us, but the techniques used are many. In some of my quilts, stitches are layered to form an embroidered battlement, which greatly enhances the textural component of the piece. The fragments of images (loose cuts of fabric) sewn into the surface, the organic quality, irregular surfaces and edges, resonate with each other to bring forward a unitary statement of the theme. The artist's vision, having made itself clear, must then prove interesting, courageous, inventive and reflect his/her independence of mind – which is not necessary sweet or pleasing. Some symbols in my quilts are universal others are meaningful only to me. These are all ideas and observations that are emotionally important to my vision and reality. Only the artist him/herself knows what impressions he/she wishes to translate into the quilt. These images are able to render the imagination, the mystical and the “never-been-said before”. All work of art is determined from the first gesture, for each portion of it must depend on every other – the same thought should weave throughout – each element original; each colour original. This action is far removed from the duplicating experience of “handwork art” or the endlessly numbered stitch patterns. Individual statements/representations in quilting resonate with thoughtfulness and conviction, their images and symbols are distinct and vivid. When starting a new piece greater concentration is required and interruptions of any kind can be devastating causing lack of focus. One must surrender oneself to the highs and lows of the bumpy progress of creating a new piece of work, experiencing the “creative fire of self-expression”, which is far removed from the endless, tiresome counting/copying from a graph sheet. The desire to create more freely and to address flexibility with embroidery thread of different thickness has resulted in an increased awareness of the thread's structure. The repeated process of embroidering a surface has increased my awareness and understanding of texture and design, which has greatly influenced the direction of my work. Embroidery also adds a sculptural dimension to the surface of the piece, which painting and piecing alone cannot achieve. My quilts are authentic and clearly reflect my perspective of reality or conception of what I regard as reality, while the abstraction of reality can serve as a theme on its own. Having developed my own personal visual language in colour and composition, I place the emphasis on design and content rather than domestic application. TECHNIQUE IS ALWAYS SECONDARY TO COMPOSITION. Needle and thread thus become instruments for the power of ideas. The "Artworld" is a notorious pseudo-intellectual brainless monster. However, many higly acclaimed "Best of Show", International and local quilts are like a bad joke, limping at you from a distance through a endless desert depleted of any original colouristic language and individual composition. Quilts should bring people in touch with the depths of their own spirit and personality, loosing themselves in its passionate nature, depth, structure, texture and composition. They should leap from the wall and shake the viewer to his/her inner soul, for the realm which they inhabit are not merely deeper than emotion or reason – they are deeper than understanding itself.